Wow, it’s been a long time since I posted! So for those who may have wondered – here’s what I’ve been up to. Last year was busy, busy, busy with more teaching than I’ve ever done. On the whole it was a good experience and I have no complaints about the students I met, who were a real joy to hang out with. But (isn’t there always a “but”?) frankly I got really physically burned out with the traveling part and yearned to spend more time at home. So that’s what I’ve been up to – hanging out around my studio and diligently working on my next book. There were several finished projects that had been languishing on my computer for years so I thought the book was mostly done and that it would be a breeze to finish – – – wrong. It’s been a slow and tedious path (is Mercury in retrograde?) but I am making progress. This book will be aimed at those who are past the beginner stage and need/want more of challenge. And I’m really happy with what I’ve come up with so far – hopefully I’ll have it done and out there by this summer. Other than that, I’ve had a little time to do some jewelry making. 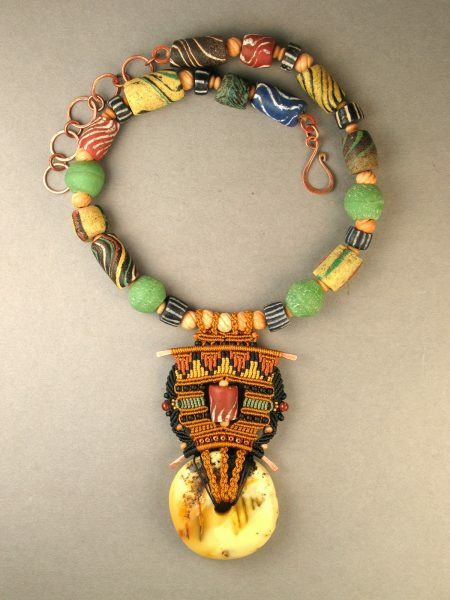 Recently, I got an email request from someone asking if I could make a necklace for her using her own treasured African trade beads. My first reaction was to say no because long ago I promised myself that I wouldn’t do any custom orders using somebody else’s beads. First of all it’s difficult to know what someone really has in mind. Is it the same necklace I’m envisioning in my mind’s eye? A Vulcan “mind-meld” would come in really handy at this point! But she assured me repeatedly that she would be happy with whatever I came up with. But it’s still tricky when working with somebody else’s beads – what happens if they don’t like the finished product? Do you cut out all of the beads and say “nice try”? Well – long story short, I decided to trust my intuition and break my own rule and go for it. And luckily she loved the necklace and it turned out to be a good experience for all. Yay! So in this case, trusting my intuition paid off. I wish that would happen every time! When I was a child in Miami, Fl. I used to watch a local kids TV show called the “Commander Bolt Show”. 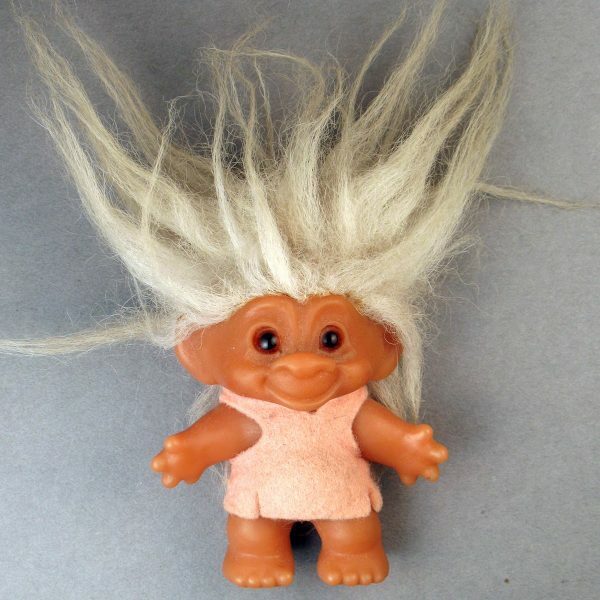 One time they had a contest to win an “Iggy” doll (otherwise known to all the world as Troll dolls). So, lo and behold, I won the contest with my pathetic and heart wrenching essay about how we had to give our dachshund “Penny” away because she nipped a neighbor’s kid on the nose and my mom didn’t want to have a dangerous animal in the house (and I was heartbroken, etc, etc…) From then on I was an Iggy aficionado and collected many. My brother Kenny and I loved to play with them and made Iggy houses and Iggy clothes – we even invented our own dialect called “Iggy Talk”. I am so fond of Iggy’s that I dressed one up like an angel and she tops our tree every Christmas. So why am I telling you all this??? Because last night I had the strangest dream. In the dream I was meeting some friends of my husband and the woman in the couple seemed uninterested in me until she saw my fascinating necklace. Not an intricate macrame/beaded concoction. No, the necklace had a simple chain with an upside-down troll doll hanging from it!!! And after seeing her positive reaction I thought – “well maybe I should make more of these”. So, what do you make of that – a new trend perhaps? An upside-down troll necklace sure would be easier to make! Previous Post: Should All Information Be Free? I love those sundial earrings. How fun they would be to make with variegated threads. 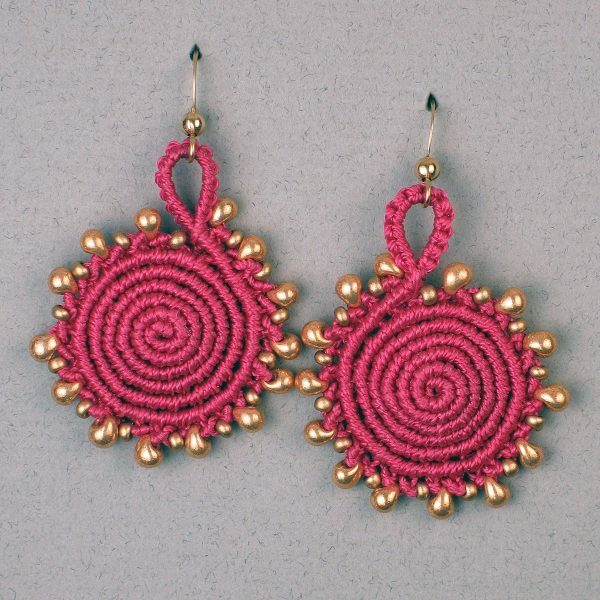 Hi Joan – I hope the instructions for the Sundial Earrings are in your next book! I have long admired the spiral-y things in your work ie Sea Shell Series #2 necklace. Is this the same technique? ~ Pat Z.
I would definitely buy an Iggy necklace and wear it proudly! I'm from Miami as well and apparently from the same Iggy era. I love your work and can't wait for your new book to come out I wish you were still here in Miami so I could take one of your classes. Maybe one day when I visit New Mexico! Pat – yes the Sundial Earrings will be in the next book. The technique's a little different but it creates the same effect. Cary – I will make you an Iggy necklace and see if you wear it! Audrey – nice to hear from another Miamian! I suppose you can not understand german (and my school-english is'nt very good). So it's probably not possible to come in contact??? I'm sure, you'd like them very much, my two trolls, who presented themselves as Lupo and Ringa (Lupo has a magnifying glass = Lupe in german and Ringa a magic ring). My way to you came over the First Zentangle Blog of the world. And here I am and now I'd like to go round for to see, what you are creating. Kind regards and have a nice weekend!